Frosted Boxes are used when retailers want to display the contained product while keeping it safe from damage and outside elements like germs and pollution. My Box Printing is the leader in providing custom frosted boxes. Our latest technology equipped production facility has the ability to produce frosted boxes in any shape or size. Made from recycled material, our frosted boxes are eco-friendly and are shipped in flat to consume less space when being transported or stored and can be assembled without any difficulties. 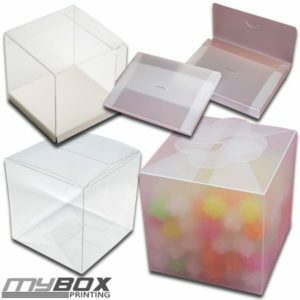 Frosted boxes are used to pack many items but below are some common uses of clear frosted boxes. We have announced a 10% discount on our custom frosted packaging boxes. To ensure delivery before Christmas, we encourage you to contact our sales department today. You can fill our request a quote form to provide us with details of your boxes and our sales team will get back to you with a price..